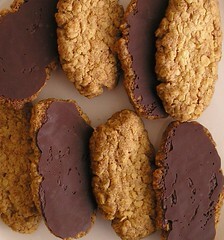 Chocolate oatmeal cookies - Do You Know The Muffin Man? Recipe from Jacques Pépin Celebrates!. Notes: Omitted currants, and added a few tablespoons of unsweetened coconut. Light and crispy due to the baking powder. Dough is very simple to make up.